TasteBudA and I are trying to brunch more in 2014. So, we started off 2014 with a weekend brunch with a couple friends at Bigham Tavern in Mount Washington. Being near the Chatham Village side of Mt. Washington instead of along Grandview Avenue makes dining at Bigham Tavern (BT) a little more special because you have the sense that the people around you came for the food (and drinks) and not as part of a Pittsburgh sightseeing tour. Right off the bat, brunch started off great with a $6.50 BT Ultimate Bloody Mary made with Absolut Peppar, garnished with meats, cheeses, pepperoncini and your typical olive and fruit. The drink was amazing. 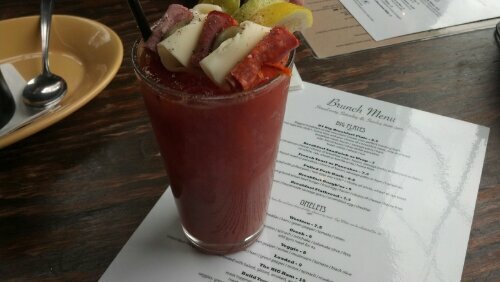 The clever addition of meat and cheese take this drink from being a beverage into being a starter for my brunch meal. Browsing the menu, the thing that caught my eye the most was the Breakfast Flatbread for $7.50. Being a “flatbread” can sometimes be vague so I asked the server about the thickness of the bread. Discovering this was not a thin crust pizza, but rather a handtossed dough, I decided to go for it. 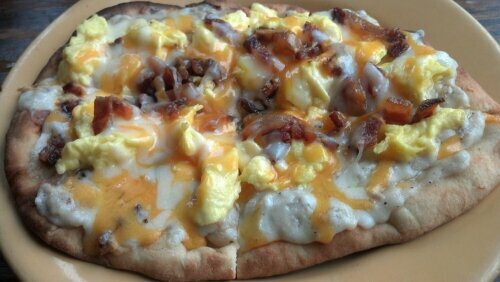 This “breakfast pizza” had sausage gravy in place of tomato sauce, and was topped with scrambled egg, bacon and cheddar cheese (pictured below) You have to figure that for a dish like this the sausage gravy would make or break the dish. It was great. The bacon was cooked not too crispy, as per my preference and the dough was light and fluffy. As a hungry boy, I was able to finish the entire thing on my own, but could picture it as a brunch starter to share. Bigham performed beyond expectations and was a great start to our Brunch Tour of 2014. I’d like to brunch at least once a month, whether in Pittsburgh or the cities we’ll be visiting in 2014. In 2014, Pittsburgh TasteBuds have plans for Columbus OH, Jacksonville FL, Tucson AZ, Cancun MX, and New Haven CT. Feel free to leave suggestions on where we should head in those cities in the comments below.